There is much to lament over the Republic of Ireland’s repeal of the Eighth Amendment, including the death of reason among some who have commented on it. This last was lamentably displayed in an essay written by First Things senior editor Matthew Schmitz and published in the Catholic Herald on Thursday. Schmitz improbably blames last month’s Irish referendum outcome on the twin evils of capitalism and democracy. By valorising efficiency, capitalism tempts us to view certain lives as “useless”. By elevating procedure, democracy encourages indifference to ultimate ends. When a cult of superficial procedural legality arises without reference to the fundamental moral law, the stage is set for a “war of the powerful against the weak”. Yet Schmitz appears to believe these two forces, by nature, inexorably corrupt a Christian society’s values. “Capitalism and democracy, for all their advantages, tempt us to make idols of efficiency and procedure, thus leading to contempt for the unproductive and indifference to ultimate ends,” he writes. This is that latest of a series of regrettable transformations at First Things since the death of its pro-market, pro-democracy founder, Fr. Richard John Neuhaus. Previous provocations culminated in two debates between Acton Institute founder Fr. Robert Sirico and First Things editor Rusty Reno. (You may watch both debates in their entirety here and here.) However, this op-ed demands the discussion be reopened. As neither capitalism nor democracy are new to Ireland, Schmitz fails to explain why it is only now that they have gained sufficient strength to repeal the inalienable right to life. Further, he contradicts his thesis in his very first sentence when he correctly notes, “Ireland has become the first nation to use the popular vote to strip the unborn of the right to life.” In such advanced capitalist democracies as the United States and Canada, unrestricted abortion-on-demand was not legalized by national referendum but imposed by unelected courts. Thus, one may safely seek the locus of the repeal vote elsewhere. John Zmirak of The Stream identifies its genesis with “decades of clericalism” and “the Culture of Death prominent in neighboring, statist EU.” He may have also included the Irish media’s unflagging bias in favor of legalized abortion activists. Over a two-year period, The Irish Times favored the abortion activists’ viewpoint 91 percent of the time, one analysis found. Pivotal to the nation’s flagging view of life is its rapidly growing secularism, a fact that becomes clear by using church attendance as a proxy for fervent belief. 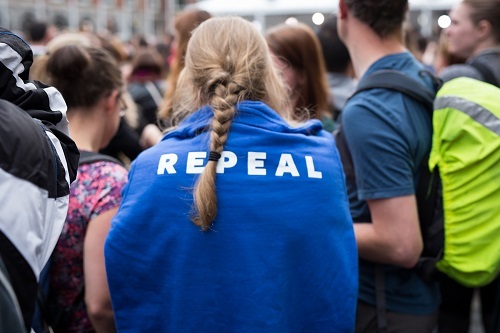 Nearly two-thirds (63 percent) of those who attend Mass weekly voted against repeal, while only 17 percent of those who attend less frequently did so. The number of Irish “nones,” those who identify with no religion, increased 74 percent between 2011 and 2016 – and the rate is more than twice as high among young Irish. These facts underline Schmitz’s greatest analytical error. Schmitz confuses the processes of the free market and capitalism for the culture in which they operate. Since they are, as he accurately notes, “procedures,” they serve as empty vessels of their citizens’ values and beliefs. Both capitalism and democracy allow the individual to purchase any good or support any politician of his or her choice. So, too, do their statist alternatives: They merely circumscribe the number of individuals making those choices. Collectivism and its political corollary, authoritarianism, impose the private preferences of the few upon the voiceless many. By conjoining his criticism of democracy to that of capitalism, Schmitz gives the distinct impression that he prefers disenfranchisement to empowerment. But if capitalism and democracy have failed, it is far from clear that Schmitz offers better alternatives. Harold Laski, stellar LSE professor, co-founder of the Left Book Club and one-time chairman of the Labour party, cautioned that: “The time is surely coming … when society will look upon the production of a weakling as a crime against itself.” Meanwhile, JBS Haldane, admired scientist and socialist, warned that: “Civilisation stands in real danger from over-production of ‘undermen’.” That’s Untermenschen in German. In the United States, too, eugenics leaders included progressives like Madison Grant and Lothrop Stoddard. Such oppression is possible only because socialism collectivizes what the free market and democracy diffuse: money and power. Private property allows each individual to accumulate the necessary resources to act with autonomy. Individual ownership gives the individual the means to defend himself (or herself) from the State’s deadly designs. If one dislikes the trajectory of the modern West, and one should, the proper course is to engage its culture that steers these processes, not to scapegoat the systems themselves and exchange them for demonstrably worse political and economic alternatives. In noting the mutually reinforcing roles of liberty and virtue, the Acton Institute fulfills its unique ministry and charism. We tell our libertarian friends that respect for private property requires a respect for the human person. A limited government and free economy only produce human flourishing within a strong culture that affirms personal responsibility, private philanthropy, and the inherent value of every human life. And we tell our fellow Christians that the economic fiction of socialism, which contradicts human nature, inevitably leads to the devaluing and destruction of all they hold dear.